I bought this camera in March 2003 after realizing that APS is headed to extinction. EOS7 also was the first real 35mm camera I ever bought. I've been using disposable cameras and APS cameras until then. The major reason for choosing APS over 35mm way back was that I had trouble loading the practice film into a compact 35mm camera displayed at the store (I seem to have two left hands). Therefore, upon purchase of the EOS7, I thought loading the film was going to be a huge hurdle for me. It turned out that loading the film was no trouble at all. Everything was automated. Now that's technological advancement (and perhaps human retrogression). EOS7 features an aluminum casing (supposedly more durable and high-quality than engineering plastic), 7-point auto-focus, as well as a pop-up flash. Mode dial is equipped with 'Scene Modes' that allows an absolute beginner to take tolerable photos. EOS7 is a great camera for beginners who don't want a camera that shouts "a beginner camera!" but needs every convenience and simplicity offered by such a camera. It's also a good camera for more advanced users who desire all the features of modern AF cameras but just can't afford top-of-the-grade ones. This camera features Canon's fabled EYE CONTROLLED FOCUS technology that allows the user to focus on objects just by looking at it. It sounds great, but it's a gimmick that's way over my little head, so I don't use it. Also, I heard that it doesn't function well for those wearing glasses, so that's another drawback for me. 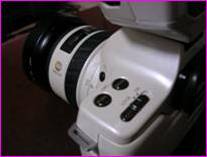 This camera is marketed as EOS ELAN7E in the United States. 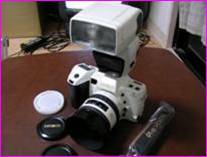 There is also EOS ELAN7, which is similar to ELAN7E, but without the EYE CONTROLLED FOCUS. Such model is not available in Japan. I wonder why. 1. Pop-up flash doesn't pop-up all that much, so external strobe is required when using large lens in poorly lit environments. 2. Portion of the casing is plastic, creating spaces between aluminum casing, causing cheap squeaks and creaks (especially around the shutter button). This spoils the solid feel of the metal casing. With the strobe raised. It doesn't pop up all that much. Command dial, with the scene modes. External strobe socket is painted black, which will definitely scrape off when using external strobes. LCD display and other various controls. Shutter button. The casing around the button is plastic, while the rest of the top cover is aluminum. This creates cheap squeaks. Rear view. Overall, it's simple to use. I bought this device in July 2003. I was facing a problem. 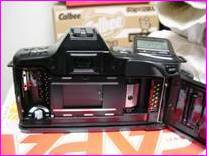 The digital camera I had (Kodak DCS280J) only had 2X zoom which was of no use when shooting distant objects. 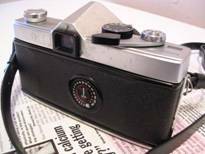 On the other hand, the 35mm camera (Canon EOS7) was often too much of a baggage, and Vectis40 and Vectis S-1 were APS, which I didn't want to use any more. When I saw the BC1300 (8X magnification!) on the net, I thought it would solve all my problems. The resolution was only 1.3 mega pixels, but I thought it would be sufficient for my purposes. The binocular portion is 8X, but the digital portion isn't. What you see through the binoculars aren't the images that are processed to the memory card. The digital portion is 4X at best. To make matters worse, Picture quality is extremely poor. The image looks like a mosaic in ancient Greek temples than a photo. It's a great concept, it's something I think many people crave for (perhaps not), but this particular product is essentially a really cheap binocular with minimal digital photo capability, with almost no consideration for ergonomics. Front view, with packaging. Comes with a case. I purchased this camera in December 2001. It was the first digital camera I ever bought. The resolution of 2.3 mega pixels is extremely low by current standards, but at the time I bought it, it was high. Professional digital cameras costing about as much as a medium-sized car had about the same resolution (although with larger sensors). Immediately after purchasing it, I had asked myself again and again why I bought a camera of such excessive performance (and cost). 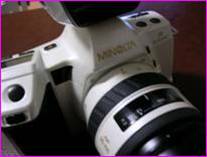 Although it was a "high-end" digital camera at the time I bought it, I was immediately dissatisfied with its performance. As a camera, everything fell short of the APS compact I owned, the Vectis40. First of all, the lens only has 2X zoom, which fall far short of Vectis40's 4X. Secondly, the camera is extremely slow. It's a slow starter, and it takes ages to process the images on to the memory card. Thirdly, the camera is a battery guzzler, requiring four AA batteries. The batteries don't last, especially if you use the LCD monitor frequently. And last but not least, macro performance is poor. 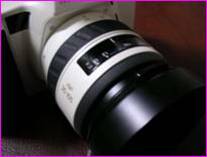 Although it has a macro mode, any attempt at taking pictures of objects closer than 30 cm result in out-of-focus blurs. This is the camera I use the most (both 35mm and digital included). 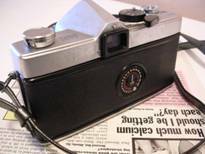 Many of the images in this site were taken with this camera. But I'm looking for a replacement (I bought its replacement, Nikon COOLPIX3100, in October 2003). I bought this camera in August 1998, for a trip to Thailand. I've been using disposable cameras until then. This camera wasn't under consideration when I entered the camera store. I wanted a Pentax Espio, a compact 35mm camera with 5X zoom lens. But when I tried to load the test film, I found that I had two left hands when it came to handling cameras. The store clerk, observing this, recommended that I try an APS camera. That was the Vectis40. Lens was a 4X zoom (30 - 120mm), which was lower than the Pentax, but I found it quite attractive (easy to use, to be exact), so I purchased it on the spot. It's a fine camera, and served me long and well until I realized that the APS is headed to extinction. 2. Battery guzzler; I didn't take as many photos in Thailand as I had planned, because the batteries dried up at the airport before departure. I had to rely on spares during the trip. 3. No manual zoom. Power zoom is fine, but it's slower than doing it manually, and eats up batteries like crazy. 4. You need a coin to open the battery compartment. Well, actually, you can open it without a coin, but you'll damage the latch. I kept opening and closing the battery compartment (to take batteries in and out to conserve them) with my fingernail, and the latch was damaged. I seriously doubt that it's splash-proof any more. Rear view. Scene modes can be seen. I bought this camera in September 2002. It was the first SLR I ever bought. I signed up for a group photo session that was to be held that month, and decided that I should use an SLR, not a compact camera. 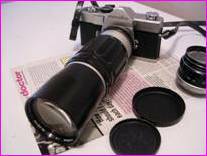 But being strapped for cash, I wanted an SLR at the lowest possible price. That was when I saw the Vectis S-1, sold at a clearance price (about 40000 yen, 40% of the suggested retail price). The fact that it was an APS camera using batteries compatible to the Vectis40 (CR2) made it quite attractive. It would enable me to use the Vectis40 as a back-up. 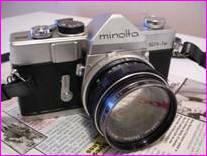 Also, it was a Minolta, the same manufacturer as the trusty Vectis40. This camera has my name engraved on it, or I thought at the time. 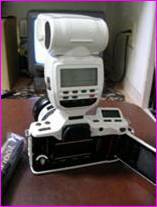 I purchased the Vectis S-1 on the spot, and took it to the shooting session the next day without testing it. It turned out that the camera was defective. The power seemed to turn off at the perfect shooting moment, turns on unexpectedly at the slightest touch. The motor of the winder is defective as well. I found more than one photos with unintended double exposures. I was the only one in the photo session with an APS camera, and the promoter of the session had no APS film in stock, so when the APS film I brought ran out, I had to go out and sprint for about half an hour to purchase additional films. This camera, had it not been defective, would have served me for a long time, despite all the drawbacks. But being defective, it served me only twice before retiring. That's what you get for buying something at a clearance price. You end up spending more. 1. Defective. I don't know about other Vectis S-1s, but the one I own is the only Vectis S-1 I know, so it places ideas in my head that all Vectis S-1s ever manufactured are defective. 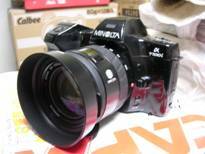 I lost all confidence I had toward Minolta. 2. Made in Malaysia. I have nothing personal against Malaysia. It's probably a wonderful country. 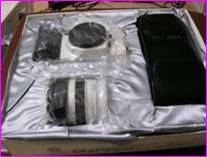 But the Vectis S-1 was the first camera I bought that was not made in Japan. 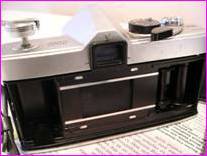 It made me doubtful of all Japanese maker cameras assembled in foreign plants. 3. Being compact, it's easy to handle, but being compact, I look as if I'm using a compact camera rather than an SLR. Rear view. Note the gray power button immediately below the finder at the upper left corner. Vectis S-1 body (rear) is more compact than the compact camera Vectis40 (front). After the Minolta Vectis S-1 experience, I thought that I'll never purchase another Minolta ever again in my life time. But, as the saying goes, never say never. 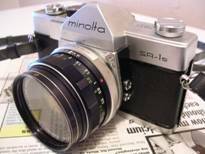 "Why in the world did you buy a Minolta? Are you crazy? Don't you ever learn," you might ask. 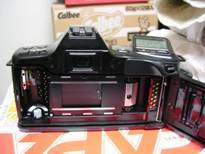 Well, the Minolta I purchased was no ordinary Minolta. What's so special about α-8700i? There must be a million α-8700i around, you might say. 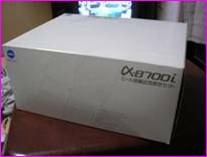 Well, this particularα-8700i is no ordinary α-8700i. It's a MIR Limited Edition. What is 'MIR'? What's so special about it? MIR was a Russian space station, launched in 1986, and destroyed intentionally in 2001. It first served as a space laboratory for the Russian Space Agency, and later became as an important test-bed for the International Space Station. In the late 1980s, two Japanese astronauts (male and female, not at the same time) went to MIR with specially-built Minolta α-8700i, as first Japanese in outer space. To commemorate this historic event, Minolta produced 8000 units of Minolta α-8700i, with the special pearl-white finish similar to the ones that went to outer space. 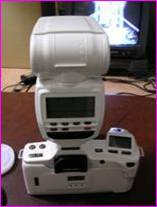 It is said that the pearl-white finish prevent the camera from heating up by strong solar rays. I read about this camera a dozen times in magazines on used cameras, so I knew about its existence, but I thought that I'll never see it. In December 2003, I went to Matsuyama on a trip. I saw a camera store, and decided to have a look inside. Although not a used camera store (majority of the cameras sold were new), in the corner was a used camera section. 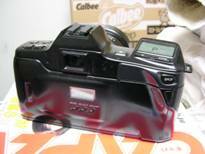 There were many cameras, and one that stood out the most was the α-8700i, with its pearl-white body and external strobe. It was in very good condition (another camera that stood out was an unused Canon New F-1 and motor drive, which was sold by the next day despite the price tag of 200000 yen). Not only was it in good condition, it came with the original box. No pocket change, but not an impossible fortune. I contemplated for several moments, and decided to purchase it. It was 71400 yen with tax. With minute scrapes, it's not exactly in mint condition, but it's in very good condition, with original manuals, and guarantees (with the name of the previous owner; no longer valid). 4. Pearl-white finish too fragile for practical use? The pearl-white body is, well..., extremely white. I responded to a sweepstakes of a magazine on used cameras, and won this camera for free. It came with a lens and an instruction manual. It looked very used. Operation and dimensions are similar to α-8700i. The major difference is that while the α-8700i is capable of shutter speeds of up to 1/8000 seconds, this camera is only capable of only up to 1/4000 seconds. 4. Setting can be immediately returned to P mode simply by pressing the P button. 2. Plastic body. 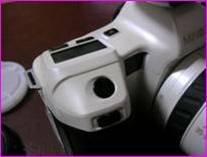 I have nothing against plastic body (I use Nikon D100), but the surface finish of this camera is very plasticky. 4. Lid of the battery compartment is not connected to the body. I'm afraid that I'll lose it someday. This isn't my camera. It's my parent's. 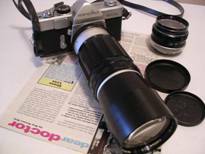 Along with this camera, he had two lenses, MC ROKKOR PF F1.7 55mm and KOMURA SUPER F5 300mm. 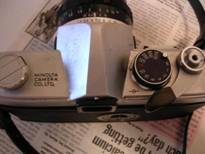 It seems that MC ROKKOR PF F1.7 55mm and SR-1s body was sold together as a set. He bought it second-hand in early 1970s, but said that it still cost a small fortune. What cost even more was the KOMURA SUPER F5 300mm. The fact that it came with a leather case (not shown) make it feel vintage. 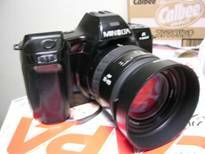 SR-1s is an improved version of Minolta's medium-range camera, the SR-1. It's more compact, and maximum shutter speed increased to 1/1000 seconds, up from 1/500 seconds. In terms of maximum shutter speed, it equaled Minolta's top-end product at the time, the SR-T101.